They look so delicious floating in the air. They are the perfect cookie. They have lots of chips, and they are symmetrically round. BUT, they sit on supermarket shelves for weeks without getting stale. How does a package of Chips Ahoy stay fresh? 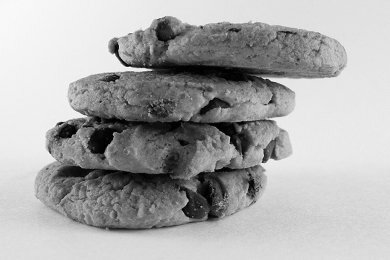 Food manufacturers have designed a way to make a cookie last forever. Sadly, the techniques they use drain all the nutrition and most of the taste out of the food. This is junk food - food without anything good for you - just sugar and fat. If Nabisco used ingredients such as butter and eggs like in a Chocolate Chip Cookies, Chips Ahoy would have a shelf life of 1 day. So, Nabisco uses chemical derivatives of butter and eggs. Those mono and diglycerides you see on the packaging are from milk. But, when you take a part of the whole, you are missing out on all the other nutritive benefits of milk (see Chocolate Milk). Nabisco will use white flour, and then add back niacin and thiamine, both found in whole wheat flour (naturally). A whole food will always be better for you than a machine processed food. A Chocolate Chip Cookies has all that goodness from butter and eggs (and you can use some wheat flour too!). While a homemade cookie is going to set you back and extra 30 calories per cookie, your body will use the vitamins you get from the cookie to help you grow. A Hard Boiled Egg is an amazingly nutritious snack. Don't forget about the chocolate - if you buy Dark Chocolate, you are adding more goodness to your cookies. Finally, a homemade cookie tastes really good. Ideally baked goods should be eaten right out of the oven - that's when they taste the best! So, avoid Chips Ahoy and start baking. Check out Chocolate Chip Cookies for a simple, nutritious recipe. The worst snack in America?